Surfing through the internet and various mobile applications is the latest medium of spending leisure time for people across the world. Starting from a teenager to a fifty-year-old person, everyone enjoys multiple applications available on their Android mobile handsets. Android is highly preferred because this operating system has more usage than other mobile OS such as Windows OS and iOS. Android OS is easy to use and it offers a user-friendly interface. Developing an application on Android platform is easier than designing it on other OS platforms. That is why business enterprises are launching mobile versions of their websites or a dedicated application on the Android platform. Keeping in mind the huge number of Android mobile users across the world, they are investing a lot in Android App Development. Android apps will not only ensure the sale of your products or services but also improve the level of communication with your customers. Game developers, e-commerce brands, retail brands, utility service providers, etc. are releasing their Android apps to grow their business. If you are also planning to develop an Android application for your business, connect with our experienced professionals at Tech Support Dubai. Why should you develop an Android application? Security and Distribution is the main advantage of this advanced OS. Google has incorporated various strong security measures to prevent from cyber threats. Multiple Sales Channels means people can access these applications from various sources apart from the Google Play Store. Hire a professional to avail Android &amp; iOS App Development service at a reasonable price and develop a unique Android application today. We at Tech Support Dubai have a team consisting of a bunch of experts who have years of experience in developing Android applications. They can assist you in the best manner to design a unique Android application using premium Android app development services. They undergo rigorous training at regular intervals which helps to enrich their technical knowledge. Furthermore, we collect regular feedback from our customers which helps to improve our service quality. Our charges are nominal and we always charge for the amount of work done by us. We have a helpline number: 042053349 at which you can call irrespective of time to reach our experts at Tech Support Dubai. 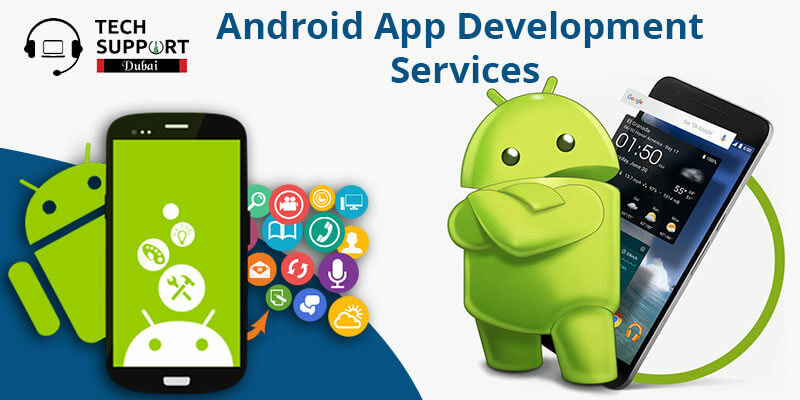 They will guide you thoroughly to develop an advanced Android application for your business. You can also drop an email to us and connect with our experts and receive a call back within the next 24 hours. In addition, you can also enjoy real-time assistance by talking to our experts over our live chat window. Our tech specialists will offer you Android &amp; iOS App Development at a budget-friendly price and design the most suitable Android application for you. We also provide iOS app development service in Dubai.